So I decided to try gardening this year. Like in the ground. I say that because I have tried, and had success, with container gardening. This year ambition got the best of me. I was ready for the transition from container to actual dirt, yard, and a little fence to keep the deer and rabbits away. With planning done, seedlings planted, and yard placement decided I started to get excited. I was very conservative with my garden knowing time is tight for gardening. Just some herbs, peppers, and lettuces. Easy. Discussing the garden with my cousin’s wife Robin, a righteous gardener in her own right, she was only too happy to generously share some tips with me. Her husband, my cousin Brian, owns Foothills Compost, the best natural and chemical free compost ever, so they know a thing or two about healthy chemical free gardening. Having a natural organic chemical free garden is of utmost importance to me, so when Robin talks to me about gardening, I listen! While Robin isn’t as cheap…I mean as thrifty…as me, she has lots of inexpensive tips. 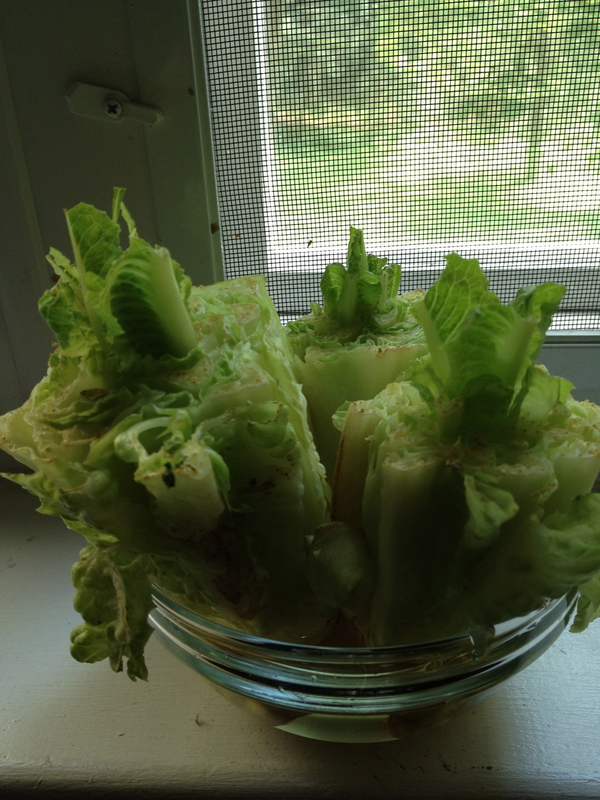 My favorite tip so far is how to regrow romaine lettuce. It is a snap, organic, and perfect for those of us on a food budget. We each a lot of salads with a variety of flavorful and crisp lettuces, and romaine is usually in the mix. 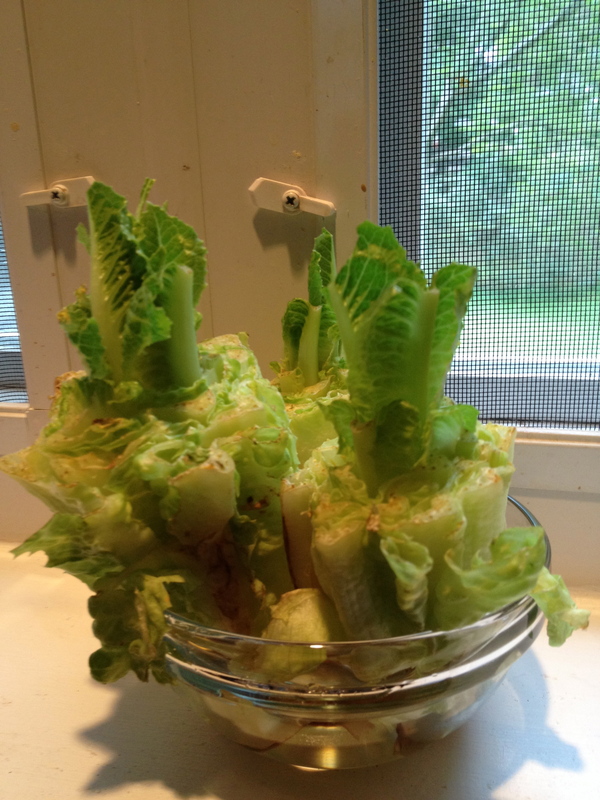 I always cut lettuces fresh for salads, so the next salad I made, I kept the bottom of the romaines. I used 3 heads for a family dinner salad, so that is where I began. After dinner, I took the bottom section of the romaine, the section that I did not use for the salad and simply put them in a bowl. I added about 1/2 inch of tap water, and set the bowl on my sunny kitchen window sill. Simple! And the romaine quickly rewarded the impatient gardener in me by sprouting the next day! That is all there is to it. Conceivably, I may not have to buy romaine lettuce anymore. If I get more heads of lettuce sprouting, I can have a continuous cycle. I am thrilled with the results so far, and will keep you posted! Let me know what happens when you try this fantastic tip. And if you are gardening, ask your favorite nursery for Foothills Compost! Day 3, more growth! We are well on the way! Look how quickly the romaine sprouted! Isn’t this fantastic? So easy! I am so excited! ← Quinoa. Grain or seed?